Reflections and Ruminations: The silence that we are uncomfortable with speaks volumes to our hearts. The silence that we are uncomfortable with speaks volumes to our hearts. I have just come out of a most refreshingly unusual retreat. Each year, the diocesan priests in Singapore take five days out of our busy and active schedules to come together to make a 5-day retreat. Apart from fulfilling this requirement of Canon Law, it had also been an occasion for us priests to encounter one another without the agenda of doing any parish-related work. For years, this diocesan retreat struggled with the element of silence. It was something that was a challenge to address by our bishop because he is a contemplative at heart. He knows how important it is for silence if one is truly intent in allowing God to speak to the heart. 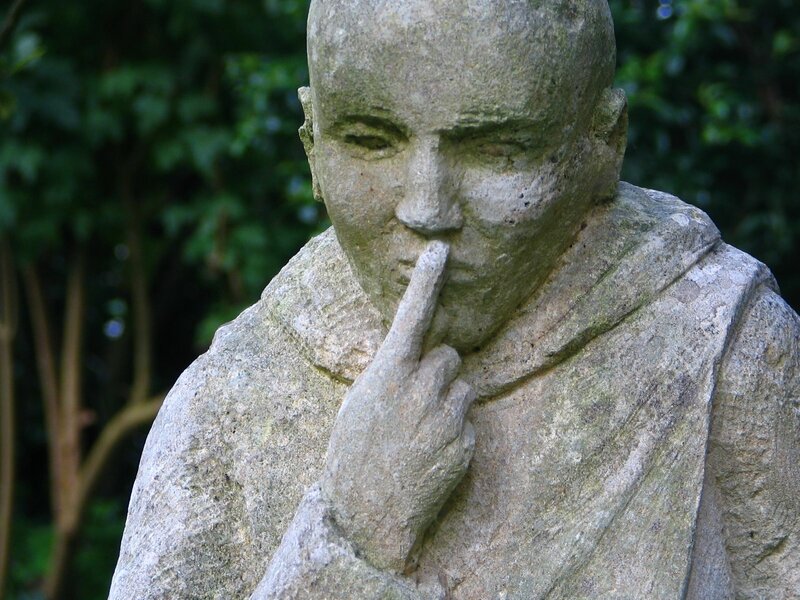 Many priests also preach about how golden silence in the spiritual life, but unfortunately, few seem to be able to maintain this at our annual retreat. The bishop, compassionately, has also seen that his priests only come together this way once a year, and are very happy to meet their brothers in a non-parochial setting. It is natural for many to want to ‘catch up’ with each other, and because of this, silence had become an issue. The bishop could only encourage his priests to observe silence and to speak about its virtue. Being the bishop that he is, he has been fighting the temptation to make this a strict requirement, enforcing it by his power as a bishop, even though he could have if he wanted to. But it was a true act of grace that something different seemd to happen this year. There was a very concerted attempt by every priest to strive to maintain silence this time. I am not sure if it was because the venue was a very different one, given the fact that we no longer had the use of our own seminary which had been the somewhat de riguer venue for our retreat in past years. A very kind and generous Christian corporation was our benefactor for this year’s retreat venue, and this could have contributed to our response by being generous with our silence as well. It made a huge difference. One of the meditations that our retreat master led us on was the ‘woman caught in adultery’ from John’s gospel. Our retreat master brought home to us an unwritten yet crucial aspect of this familiar episode. After having been questioned by his accusers of whether to stone the woman as prescribed by the Law of Moses or not, John tells us that Jesus bent down and started writing on the ground with his finger. Much has been speculated on what Jesus wrote, but this was not what we were led to ponder. That Jesus said nothing as a response had a great teaching lesson for those of us who are perhaps too prone to give answers that are pithy, trite or even scathing and cutting. After all, Jesus could have easily silenced his interlocutors and adversaries if he wanted to. But this would be to deal with violence using the same violence of the enemy. He had a counter-intuitive response. Instead, he let his silence be the sword of conscience that revealed the innermost intentions of the heart. Silence has the amazing ability to do that. When one doesn’t hear the words of admonition for a wrongful act, one isn’t given an instruction or accusation from without. When one is given only silence as a response, it leaves the wrongdoer himself to be his own judge, and one is then forced in a most unthreatened way to be honest and strict with oneself without shame and without the fear of embarrassment. This was mercy at its best, and it gave the woman’s accusers the freedom that they needed to walk away, one by one, beginning with the eldest. Perhaps the silence that so many priests in our presbyterium seemed to struggle with was due to the fact that they couldn’t appreciate the freedom that a freely-willed silence gives. I cannot be sure of this, but I have the inkling that the bishop knew this as well, and thus didn’t use his position as a bishop to insist on this. He must have known that we had to really own it and do it willingly with love if we were to attain the benefit of silence as a free and willing response. Well, it certainly took a long time for it to happen. If this bodes true for us priests, it must certainly do the same for our laity, the sheep we are given to lead in our role as their shepherds. We need to not only tell them that silence has great benefit in a world that is becoming increasingly loud and terribly noisy. Silence aids the maturing of the interior life that so many pay scant attention to develop and grow. Our worship of God in our communal celebrations need to have within it an appreciation of the element of silence as well, where God speaks to the depths of our hearts, revealing to us not just himself, but our truest selves, stripped of our myriad pretenses and masks that often fool even ourselves. Thanks for sharing Fr Luke. Greatly appreciated and I I hope you and the brothers had a fruitful retreat. We did, Fr Jovita, and we missed the presence of our brother priests like you who are away on study leave. God be with you in your academic endeavours, and may he bless you richly for your selflessness and generosity. How can one be still? Outwardly we can be silent but inwardly it is too noisy. Thank you for the article on SILENCE. I think if each person can spend 5 minutes a day just be SILENT and not think of anything, except to know that he/she is in communion with God, the world will be a BETTER and NICER place. Also I noticed that in our mass, very few priests will pause for a moment of SILENCE when he comes to the part of the prayer for the faithful departed after the consecration, to let the congregation pray for their faithful departed.